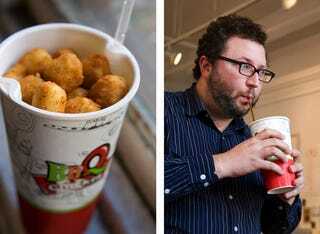 This has to be the best thing in fast food convenience since the freakin' straw: A cup that holds your chicken nuggets AND your soda. Nuggets on top, soda on bottom—hand to nugget, straw to face. AT THE SAME TIME. Amazing. Adam's vivisection of the Col-Pop shows that the material between the pops and the pop is a thin membrane, but he doesn't comment on the effectiveness of keeping the two separate. I mean, the obvious problem with this triumph of science over nature is that piping-hot chicken nuggets will water your Dr. Pepper down to Diet Coke-like consistency, while cold soda will turn your steaming nuggets into tough, lukewarm chunks of breaded styrofoam. The chain offering this plastic marvel, BBQ Chicken, has locations in NY, NJ and NC—can any Giz readers offer a review?